My name is Nick and I’m addicted to ClickFunnels. I also hate ClickFunnels, and I’ll tell you why in my No B.S. ClickFunnels review. Read most ClickFunnels reviews and it’s just a clickable lovefest full of links to test out the 2-Week Trial (like <—- that one). I thinks it’s those sticky cookies that get everyone all hot and bothered. Ok, are you done eating all the cookies? Let’s get back to the review of ClickFunnels software. This review is going to give you the good, bad, ugly, and everything in between if you’re interested in trying ClickFunnels for you online business. He has FunnelScripts, FunnelU, FunnelGraffiti, FunnelImmersion, FunnelCakes…just kidding about the last one, just checking if you’re paying attention. Just kidding…I already call myself that! Kidding again…or am I? As you can see I’m still using SamCart for my order forms for reasons. Mostly because I’m too lazy/procrastinating moving my order forms to ClickFunnels (which has pretty awesome order forms too). You can customize an order form in ClickFunnels by adding testimonials, reviews, videos, and pretty much anything you want to boost conversions. I’ve been full-time online since May 2016 and haven’t looked back since. It’s been full of ups and downs and currently averaging close to $8,000/month. My goal is to get to $10,000/month consistently while maintaining my current lifestyle hanging out with my wife and 2 little girls, traveling, being a foodie, and hacking funnels on the side. That’s one of my favorite things about ClickFunnels, time-saving. Sure, it’s really easy to start, maintain, and profit from an online business using ClickFunnels software, however, TIME is my most valuable possession. If you can save me time (and make me money), I’ll gladly pay you $97, $197, and even $297 a month. You can see a full list of ClickFunnels Integrations on the home page here. I joined ClickFunnels about a year and half ago and just like any brand new SAAS company, it had a few bugs. I personally, haven’t experienced a bug inside of ClickFunnels in almost 1 year and I’m in there everyday. I see a few posts inside the ClickFunnels Facebook Group, but it’s mostly people who are confused about something or aren’t solution-oriented. You”ll run into problems in your business, you just have to take a breathe, CHILL, log into your ClickFunnels account and figure it out. I really don’t think this is true, but I see other ClickFunnels users complain about it, although not enough to cancel their account. I’ve only had one instance where ClickFunnels customer service was unable to fix a problem I’ve had and it really wasn’t ClickFunnels fault. I had a separate SEO WordPress plugin that was conflicting with my ClickFunnels WordPress Plugin causing a weird Meta Data glitch. Guess what? I figured it out on my own and now I feel like a SUPER-HERO, because now I know what “meta-data” is. For $97-$297 per month, we should expect pretty good customer service and I think that’s a good way to sum up ClickFunnels support team – pretty good. You can hire funnel consultants and designers for thousands of bucks or you can shell out $97 and deal with “pretty good” customer service. Hey, at least you don’t have to tip! ClickFunnels has a never-ending stream of products to sell, upsell, downsell, cross-sell, and sell-sell you after joining ClickFunnels. 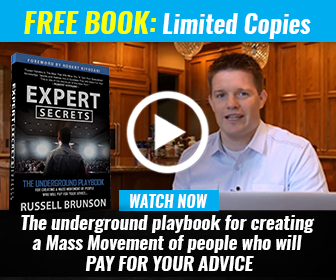 In fact, most people probably join ClickFunnels from a free book or other product. They have products ranging from free to $25,000 and I think even a 1 million dollar coaching program. It’s pretty insane. And for a newbie like I was, it’s overwhelming, scary, and difficult to overcome. You think you HAVE to do all of that to run a successful business. You don’t. Start with ONE product. ONE message. Just ONE. It’s tempting to buy everything they have to offer and if you can, feel free. Go nuts. But really all you need is the ClickFunnels software and a dream. I tried that 1 year ago…it didn’t work. You have to LEARN and take ACTION. If it weren’t for reading DotCom Secrets and Expert Secrets I definitely wouldn’t be where I am today. You can actually get both of these books absolutely FREE (just cover shipping) by clicking the links above. Let’s go ahead and finish this article first, shall we? If you aren’t willing to put in the work to grow your online business, maybe ClickFunnels isn’t for you. I see people complain about paying $5.95 for each of those books, yet they want to make $10,000 a month online. Invest in yourself and you’ll see the results! How about I finish this review with a few more positives about ClickFunnels and try to convince you why you need it and what I’m willing to do to help you! My first digital product took me 2 years to finish and launch. I’m about to launch my 6th digital product and now I can create and launch one in about 2 weeks from idea to finished product. Now, with ClickFunnels I can have a sales page, order form, download page in about 12-16 hours of work including images, copywriting, integrations, and more. That’s 2 or 3 days of focused work. It’s incredible. So incredible that I had to tell you about it! My last product launch has netted me about $35,000 in 3 months. For 16 hours of work, that comes out to over $2,187 an hour. I’ll take it! Maybe you already have a product to sell or want to sell an affiliate product. I have better news. 30-minutes to put your sales funnel together. 1-minute for your first sale to come through. One of the best feelings in the world was hearing that first “ding” from Stripe when I made a sale while playing with my kids. The second best feeling was waking up in the morning and seeing I had made $100 overnight or even $400 one night! It’s amazing. The best part about ClickFunnels for me as a busy husband, father of 2 toddlers, and entrepreneur is TIME-SAVING! Time is my most valuable asset. Time is money and money is freedom. What do most of us want? FREEDOM! Like, Braveheart…one of my favorite movies! You want to test drive the Mercedes before committing the hefty payment right? You can test ClickFunnels for 2 weeks AND help pay for my future Mercedes in the process! I REALLY want to you succeed with ClickFunnels, so I’m offering you access to $997 in BONUSES when you start your 2-Week Trial using my link. So, am I your new best friend? Just click HERE and start your 14-Day Trial and let’s chat! I liked it from beginning to end. I’ve spent the last black friday/ cyber monday 4-5 days searching for discounts for IM tools. Even though Clickfunnels doesn’t have one (I mean really slashed the price), I’ve learned a lot, saw a lot and convinced that it is the Tool to go. and save some money aside in the process to be ready to handle at least 3-4 months of full CF membership at $97/month. And like Russel says it: you’re just one funnel away.. Ok I’ll run with that. Awesome idea. If I had to start over I would have everything ready to rock and roll, so you can start making money right when you start your trial! Good luck! Thanks Nick for the funny introduction. I liked the whole review. I came across Clickfunnels 2 years ago on a training module. I built my first funnel around a product as quickly as possible and started sending traffic to it, you can’t imagine how much I was happy to make that first sale. But it was my only sale till today using clickfunnels, I had stopped my subscription with them due to the 97$ mark, but after two years I came to the conclusion that they are very important to do marketing today, but I have differnt choices as to which platform to use . I compared them to leadpages, and I think leadpages do have some price advantage, needing your special advice for that, which one would you recommend? Cheers ! Looks like you have put so much effort into this post. Awesome man! BTW…I have subscribed to dotcomsecrets course from your link…let’s see what they offer.